Sugar and other sweeteners are the main ingredients in some of America’s favorite drinks and foods. And they’ve become ingrained in the American diet, considering the average American consumes about 20 teaspoons, or 80 grams, of sugar a day. The sweet stuff is a ubiquitous source of calories in the Western diet. However, now experts argue, sweeteners are contributors to major diseases. The human body wasn’t designed to process these levels of sweeteners, as evident by the rising tide of diseases associated with them. Besides cavities, excess sweetener consumption directly contributes to the development of type 2 diabetes, heart disease, and non-alcoholic fatty liver disease, which is expected to account for the majority of liver transplant requests in the U.S.
It’s not those occasional treats that has medical experts concerned, but the high daily consumption for the overwhelming majority of Americans. Dr. Alan Greene, a pediatrician who sits on the board of the Institute for Responsible Nutrition, says sugar-sweetened beverages, along with cakes, cookies, and ice cream, are the major offenders, but hidden sources of added sugars are also a concern. “What happens is that Americans are having dessert several times a day and don’t know it,” he told Healthline. While there are the obvious culprits of added sugar, such as the teaspoon of sugar in your coffee or your child’s bowl of cereal, there are numerous other ways added sweeteners sneak into the American diet. Starting off your day with something like low-fat yogurt, fruit juice, cereal, or a granola bar may sound like a smart choice, but these healthy sounding foods can pack hidden sugars. For example, a 6-ounce container of Dannon All Natural Plain Lowfat Yogurt contains 12 grams of sugar. An 8-ounce glass of Tropicana Pure Premium orange juice contains 22 grams of sugar. A two-bar pack of Nature Valley Oats ‘n’ Honey Granola Bars has 11 grams of sugar. (Honey is the second listed sweetener after sugar. The bars also contain brown sugar syrup.) While the label says “natural,” “pure,” and “nature,” words the U.S. Food and Drug Administration (FDA) doesn’t regulate, these all count as sources of added sugar. But breakfast is just the start. As a whole, total calorie intake comes from added sugars. A third comes from sugar-sweetened beverages, including soft drinks, sports drinks, and fruit drinks. A single 20-ounce bottle of Coca-Cola, the best-selling soda in the world, contains 65 grams of sugar. The same size Pepsi has 69 grams, and the “real sugar” variety has 66 grams. A 20-ounce Gatorade has 34 grams of sugar. But sugary drinks labeled juice often have more sugar per ounce than most sodas on the market. For example, an 11.5 ounce can of Minute Maid Cranberry Apple Cocktail—“made with real fruit juice”—has 58 grams of sugar, while a 12-ounce can of Pepsi has 41 grams. For foods, the main offenders are obvious: syrups, candy, cakes, cookies, and dairy desserts like ice cream. One Hostess Cupcake, of which Americans eat 600 million a year, contains 21 grams of sugar. Two Little Debbie Swiss Cake Rolls contain 27 grams, the same as a Snickers bar. M&Ms, the best selling candy in the United States, contains 30 grams of sugar per serving, not to mention 30 percent of the daily value of saturated fat. While these foods all list their sugar content on their nutritional label, it’s one ingredient that doesn’t have a defined daily value attached to it. Groups like the American Heart Association (AHA) and the World Health Organization (WHO) recommend that less than 10 percent of a person’s diet come from added sugars. Ideally, most women shouldn’t consume more than 100 calories from sugar a day, or about six teaspoons. For men, that’s 150 calories, or nine teaspoons. As one teaspoon contains four grams of sugar, a cup of most commercial apple juices—even those labeled 100-percent juice—will max you out for the day. In May, the FDA finalized new food labels, which by July 2018 will include total and added sugars expressed as a daily value, a move heralded by nutritional experts and bemoaned by those in the sweetener industry. But rarely do changes in regulation come without backlash from those who profit from selling the sweet stuff. In 2002, WHO released TRS 196, a document that evaluated best practices for its global strategy on how to reduce noncommunicable diseases. One recommendation was to limit sugar intake to less than 10 percent of a person’s daily calories. The report was attacked by sugar manufacturers on its scientific merit and assumptions, sparking yet another battle between health scientists and the food industry. Groups like the Sugar Association, Corn Refiners’ Association, International Dairy Foods Association, National Corn Growers’ Association, and Snack Food Association wrote letters protesting the recommendation on the grounds there wasn’t enough evidence to support the claims. “They claimed that there are no bad foods, only bad diets, and these were due to personal choices,” Norwegian nutritionist Kaare R. Norum, professor at the University of Olso, wrote of the industry pushback. The sugar industry went so far as to ask Tommy Thompson, then-U.S. Secretary for Health and Human Services, to withhold the U.S. portion of payment to WHO if the report was published. The move was compared to blackmail and considered worse than any tactic used by even the tobacco industry. It was published and no funding was withheld. Sugar has become the recent nutritional target du jour, like cholesterol and saturated and trans fats before it. During food processing, important nutrients and fiber are removed while sugar is added to make it palatable. A recent study appearing in the British Medical Journal found that ultra-processed foods—those with the most artificial ingredients—make up nearly 58 percent of calories consumed, 90 percent of which were added sugars. Overall, the researchers found, more than 82 percent of the 9,317 people surveyed exceeded the recommended 10 percent of calories from sugars. Sugar, by itself, isn’t the devil in the cupboard, but its excess consumption has many experts worried about the health of our nation. One of the loudest critics of the issue is Dr. Robert Lustig, a pediatric endocrinologist at the University of California, San Francisco, and founder of the Institute for Responsible Nutrition. He’s not shy to call sugar’s presence in the American diet a toxin or poison. Sugar has been part of the human diet for centuries. Once considered a luxury, Christopher Columbus even brought the “white gold” plants with him during his 1492 voyage to North America, and the sugarcane crop thrived. By the 1800s, the average American consumed 4 pounds of sugar a year. It’s still a major global cash crop and part of nearly every culture on the planet. 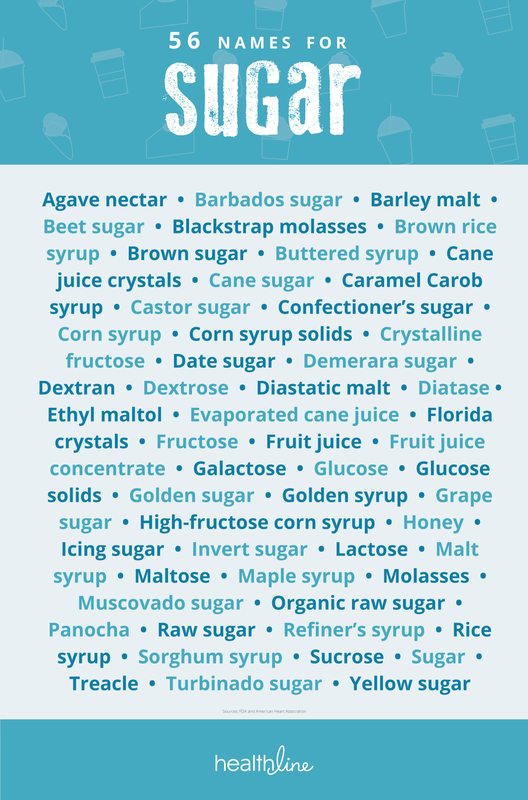 But when referring to sugar, we’re not merely talking about table sugar made from sugarcane and beets, but also those made from corn, like corn syrup and high-fructose corn syrup. All told, sugar is known by 56 names, any of which can appear on food labels. Add all of those aliases under the umbrella of caloric sweeteners and at its peak in 1999, Americans were consuming 155 pounds of caloric sweeteners per year, or about 52 teaspoons per day, according to the U.S. Department of Agriculture (USDA). Now the average American’s annual consumption is about 105 pounds a year, a sign that consumer attitudes about the white stuff have begun to shift. “In a sense, sugar is the number one food additive. It turns up in some unlikely places, such as pizza, bread, hot dogs, boxed mixed rice, soup, crackers, spaghetti sauce, lunch meat, canned vegetables, fruit drinks, flavored yogurt, ketchup, salad dressing, mayonnaise, and some peanut butter,” a 2000 USDA report states. From 2005 to 2009, 77 percent of all calories purchased in the U.S. contained caloric sweeteners, according to a 2012 from the University of North Carolina at Chapel Hill. They were found in the vast majority of places you’d expect—sweet snacks, pies, cookies, cakes, and sugar-sweetened beverages—but also in ready-to-eat cereals and granola, protein, and energy bars, as noted above. Corn syrup is the most widely used sweetener in the U.S. food market, followed by sorghum, cane sugar, high-fructose corn syrup, and fruit juice concentrate. So what are better for you, sugar or corn-based sweeteners? That was the basis for a lawsuit between the sugar industry and high-fructose corn syrup makers. Both claimed the other misrepresented each other in advertisements, including corn syrup’s advertisements that all sugars are the same and “Your body can't tell the difference.” After years in the courts, the case finally went to trial in Los Angeles last November, but on Nov. 20, the two groups announced they reached a confidential settlement. The FDA, however, agrees that sugars, whether from corn, beets or sugar cane, are essentially the same and recommends everyone limit their consumption of all of them. Too much sweet stuff can lead to disease. Too little? Well, there’s no such thing. Naturally occurring sugars, like those in fruits or dairy products, give experts little concern because they also bring fiber, minerals, and other nutrients. Greene says while it’s unlikely to see someone eat five apples in a row, it’s not uncommon to see someone consume the same level of sugar, if not more, while snacking on cookies or drinking soda. “The system is hammered with these levels that it wasn’t designed to handle,” he said. Refined sugar and other sweeteners—including high-fructose corn syrup and other added sugars with the suffix -ose—offer only calories and no nutritional value. Labeled “empty calories,” experts say sugar calories aren’t empty and do more harm to the human body than once realized. They’re energy-dense micronutrient-poor foods, meaning it provides plenty of energy but nothing else the body needs. And if you don’t burn that energy off, your body turns it to fat. This occurs even quicker if it comes in liquid form because the body doesn’t feel full, like if they were consumed in solid form. How the food and beverage industry preys on our children to maximize profits. Sugar affects our brain pathways just like addictive drugs, and most of us don’t realize how much we’re eating.